SINGAPORE, 4 April 2014 – Singapore Changi Airport today welcomed the arrival of Uzbekistan Airways, making the launch of Singapore’s first direct air link to Central Asia. The national carrier of the Republic of Uzbekistan will operate a twice-weekly service between Tashkent and Singapore, through a circular routing with Kuala Lumpur, utilising a 247-seat Boeing 767-300 aircraft in a two-class configuration. To commemorate this new link, Mr Akmal Akbarov, First Deputy General Director of Uzbekistan Airways and Mr Nabijon Kasimov, the Chairman of the Association of Private Touristic Organisations of Uzbekistan, were on board the inaugural flight that arrived at Changi at 0807 hours. They were welcomed by Mr Alisher Kurmanov, Ambassador Extraordinary and Plenipotentiary of the Republic of Uzbekistan to the Republic of Korea (former Ambassador to Singapore), and Mr Wong Woon Liong, Senior Advisor of Changi Airport Group. Uzbekistan Airways and Tashkent are respectively the second carrier and second new city link this year for Changi Airport. This follows the launch of a service to Guiyang by Lucky Air in January. The new Tashkent-Singapore service opens up business and tourism opportunities into the respective hinterlands. From its Tashkent hub, Uzbekistan Airways provides travellers direct and quick access to Central Asia and the Russian Siberian Federal District through its extensive regional flight network. Likewise, Singapore provides travellers from Central Asia a strategic gateway to Southeast Asia and Southwest Pacific, with over 50 city links and close to 2,000 weekly services. Uzbekistan is among Central Asia’s most rapidly developing economies. Since 2006, the country’s GDP growth has performed better than those of developing European and Central Asian markets. With its robust economic growth, the International Air Transport Association has forecast Uzbekistan to be the fastest growing marketfor international passenger traffic by 2017. In recent years, there has been a growing interest amongst Singapore businesses to explore commercial opportunities in Central Asia, resulting in a strong increase in bilateral trade, which more than doubled in 2013 to S$28 million. Furthermore, Singapore has held various business forums with Uzbekistan on a regular basis. This new service will foster stronger bilateral economic ties and people flow between the two countries. Holiday-makers in Singapore now have even more interesting itineraries to consider, including journeying along the Silk Routes to Tashkent and other historical Uzbek cities like Bukhara, Khiva and Samarkand. Tashkent, for example, has a history of more than 2,000 years on the Great Silk Road stretching from China to Southern Europe. Also known as the “Star of the Orient”, it is the largest city, and the economic and cultural heart of Central Asia. Tashkent is also famous for its exceptionally valuable and captivating architecture, intertwined with Central Asia and European traditions from the late 18th century. 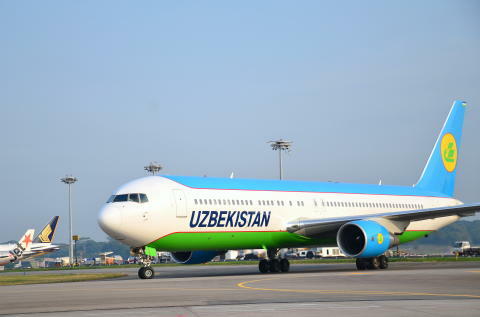 To celebrate its commencement of operations at Changi Airport, Uzbekistan Airways is offering promotional fares for return economy class tickets starting from S$979. Fares exclude all applicable fees and surcharges, and terms and conditions apply. Details are available at www.changiairport.com/uzairways.